Many people, especially children, dread going to the dentist. To help calm the nerves of some of his young, nervous patients Dr. Paul Weiss has trained his golden retriever Brooke to act as a therapy dog. Weiss enrolled Brooke in a two-week boot camp and then had her certified by Therapy Dogs International in May. With her certification Brooke was brought on as the newest team member of Weiss’ pediatric dental practice in Williamsville, New York. Each Thursday, the 4-year-old golden retriever is on hand to help comfort nervous patients. 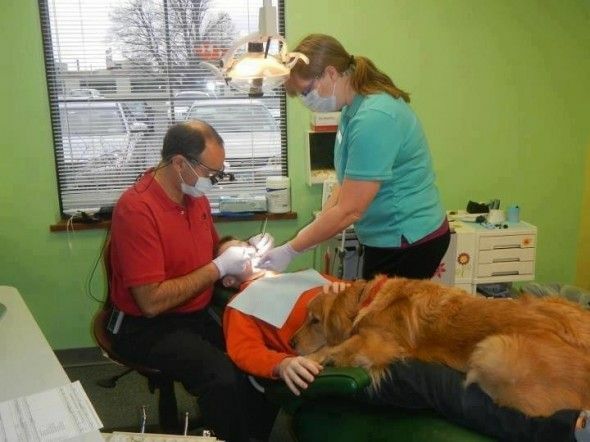 “If a child is afraid of getting her teeth cleaned, Brooke can sit next to them in the chair and the kid can have their hand on the dog,” said Weiss. Brooke also works the reception area to greet the patients. Weiss takes proper precautions with Brooke. All patients are notified ahead of time that Brooke will be present. Therefore anyone with an allergy or reason to avoid dogs will know. Brooke also is bathed before each visit and the office is cleaned thoroughly after she leaves. Many patients love having Brooke around and try to schedule their appointments for Thursdays. “If demand increases we may have to up her hours,” said Weiss.